The Tacoma Art Museum is going to have a busy February. From January 27 to February 17, the TAM will be opening five new exhibitions all highlighting, showcasing, and reframing what we know as Western American art. I spoke with Faith Brower at the TAM about why these pieces of art are so timely and provocative. What is your official title at the TAM? Faith: It’s the Haub Curator of Western American Art. 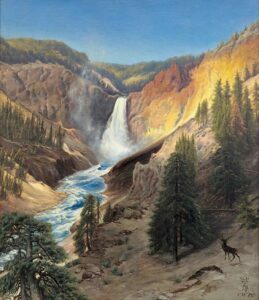 For someone who may not be familiar, can you help define Western American art? Faith: That is a great question! It is art from the broader Western region, but at the TAM we really focus on Northwest art. Simply put, it’s artists who have lived or are currently living in the West, or artists depicting the West in their work. What drew you into this genre of artwork? Faith: Living in the West, you are exposed to a lot of that work. For me, I fell in love with this type of work when I moved out here in 2003. The cliché of Western art is the “Cowboys and Indians” outdated genre, but we are now able to unpack Western art a little bit more. We can look at it more broadly, away from the clichés, and that’s an important reason for me to work in this genre. Can you tell me about the upcoming exhibitions? Faith: All five exhibits were conceived to help people understand Western art and try to pull it out of the clichéd confines it has been placed in in the past. The first exhibition is perhaps the most straightforward. It shows animals sculptures in bronze. Sometimes in urban environments we may seem disconnected from wildlife and the animals that live in our region. This is a fantastic exhibition that puts the focus on them. We have an exhibition on immigrant artists. That exhibition was developed as a response to contemporary issues and how those issues could be discussed through our historical collection of Western art. One of the goals of this exhibition is to help build empathy for immigrants today and showing the range of places where people were immigrating from in order to come to the West. It’s a great mix of artists from the 19th century until today and in a range of mediums. Our next exhibition is called Native Portraiture. 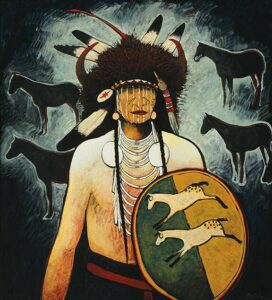 Many collections of Western art include portraits of Native Americans, but a lot of these portraits are made by non-Native artists. This exhibition is looking to unpack some of the stereotypes and misrepresentations of people that have occurred through this. There is an inherent power struggle that arises through this relationship. 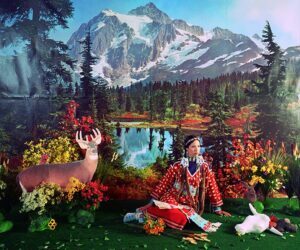 This exhibition is going to include 10 contemporary Native artists. They are really tackling issues of representation of identity through their work. One of the artists works in 3-dimensional photographs. You put on 3-D glasses to see the images pop out of the frame. We have an exhibition on settlements called Places to Call Home. This covers early 20th century work to contemporary work and shows a range of how people have lived in the West. There are urban environments, villages, towns. So much of the Western art genre only shows the agricultural or rural regions, so this is drawing focus the other way. There are cityscapes and more contemporary abstractions. It’s a wonderful show. Our final show is called Winter in the West. That is in our study gallery. It’s a space that allows us to hang paintings in a “salon style.” You will be able to compare and contrast works every easily in a smaller space. So much of Western art is depicting wide-open skies, mountains, and coastlines. But this exhibition is representing and capturing the winter season. All of these shows will be open by Saturday, February 17, in time for our Western Fest, which is also a free admission day at the museum. There will be create-your-own-art stations, storytelling, dancing, and food throughout the day. Why do you think Western art is still relevant and important today? Faith: It is a large section of the American art genre. But more importantly, so many changes have been, and are still, taking place in the West. There are people moving from agricultural areas to urban areas, how people are immigrating to the US through Western cities, how Native people are living on reservations as well as in urban areas, the changing of the environment in the West… All of these issues are more relevant than ever and these art exhibitions are a way to connect with and explore these issues. There are about 80 different artists who have diverse perspectives and ways to comment on these ideas. We are really looking forward to this. The TAM will have free admission all day on February 17 and their Western Fest goes from 12­–4pm. This site was created by Tacoma expert and local realtor, Marguerite Martin. Subscribe and stay up to date.